(Newser) – There weren't that many people who predicted a Donald Trump presidency—and two out of that small number also predicted Trump wouldn't serve a full term. Filmmaker Michael Moore also predicted a Trump presidency, then admonished supposedly "shocked" Democrats that they just hadn't been paying attention. On MSNBC's Morning Joe Friday, Moore said he doesn't think Trump will serve a full four years in office, The Week reports. "He has no ideology, except the ideology of Donald J. Trump, and when you have a narcissist like that who is so narcissistic where it's all about him, he will—maybe unintentionally—break laws," Moore said. "He will break laws because he's only thinking about what's best for him." He indicated Trump will either be impeached as a result of law-breaking, or will resign. 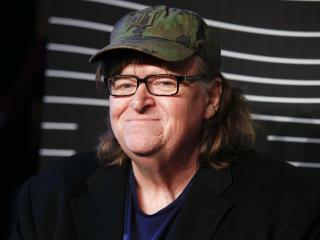 Michael Moore is not an American citizen! A stupid statement just like all the babble you get from Moore himself. He is irrelevant and a narcissist looking for a new following...he has none.